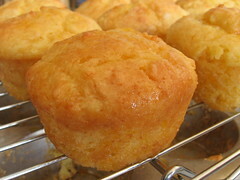 Extremely Orange, Orange Muffins - Do You Know The Muffin Man? Notes: You must skim the entire process of how this muffin recipe was derived: over a dozen trials before he was satisfied! Evidence that this recipe lives up to its name: using orange zest, orange yogurt, orange extract and orange oil in the muffin; mashing the orange zest into the sugar to imbue it with the fragrant oils; reducing ½ cup of juice to 2 tbsp for the glaze, plus the juice of another two oranges and a bit of orange oil. For colour, one option in the recipe is Kool-Aid (!). These are certainly very flavourful, most of it coming from the glaze. They're a bit boring (no nuts or fruit) though.